A refreshing and flavorful salad that’s full of exotic spicy kick. 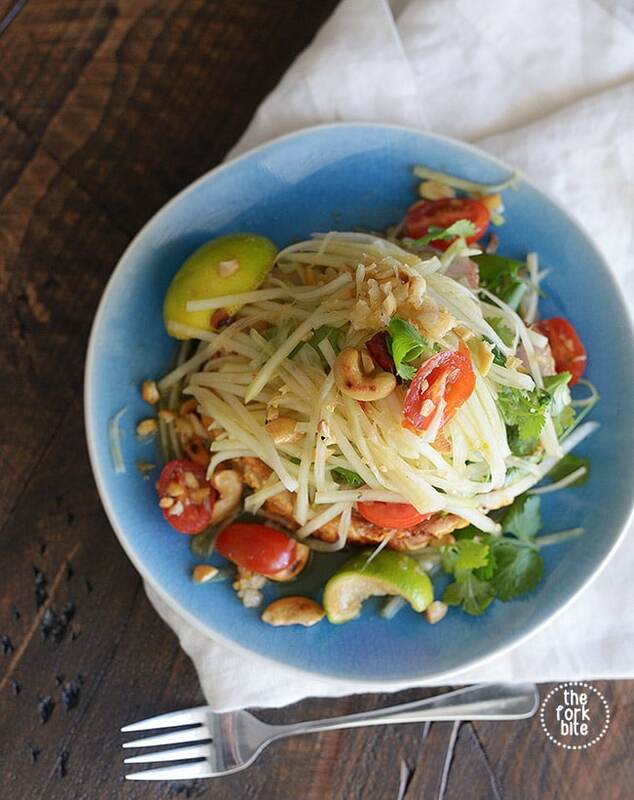 This Thai Green Papaya Salad can include chopped peanuts, cilantro, tomatoes, and sliced green beans. I don’t know about you, but when summer comes, our meat consumption drops dramatically and the fruits and vegetables become the fare of choice. Sometimes, we just use cheese or nuts for the protein necessary for a complete meal. Shrimp also becomes far more important than it is during the winter months. I go through packages of frozen shrimp and plenty of dried shrimp too. 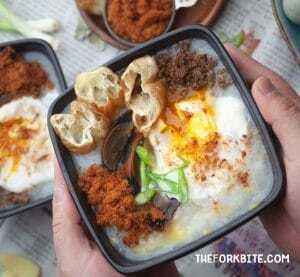 Last week when the temperature soared, I didn’t even feel like cooking. Even though the house has air conditioning, I had to go outside and the heat, even for that short time, killed my appetite. I suppose the five homemade fruit Popsicles I had throughout the afternoon may have also had something to do with it. Seriously, if you don’t own popsicle molds you really need to buy some. I now own enough to make 18 homemade pops at once. I make all kinds from strictly fruit ones to fruit and yogurt pops. I hide them in the back of the freezer and dole them out to others rather stingily. They’re great healthy snacks….but back to the reason, I mentioned my lack of hunger. Anyway, nothing sounded good and it was getting late. Everyone would want something to eat pretty soon. I looked through my cupboards and the fridge to see what all I had on hand if hoped something would catch my eye. The papaya did, so that’s where I started to search the net to see if anything looked good and used everything I had on hand. I certainly wasn’t going back out to pick up something at the grocery, no matter how quickly I could do it. I found this really interesting salad that didn’t require me to leave the house for anything. I even had palm sugar. While this dish required a lot of pounding and crushing, the extra effort just helped renew my appetite, which grew as I combined all the ingredients for the salad and smelled their delicious blend of odors. A word of caution is necessary. Don’t overdo it when you crush the dried shrimp, you want pieces, not powder. 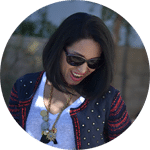 This salad was a hit and one that I’ll add to my list of favorites. I wouldn’t have found it had I not eaten all those homemade popsicles, which reminds me, I think a blueberry kiwi popsicle is calling my name. I like to add Roast Porchetta on my green papaya salad, oh boy! this makes the porchetta refreshingly good and doesn’t feel greasy at all. 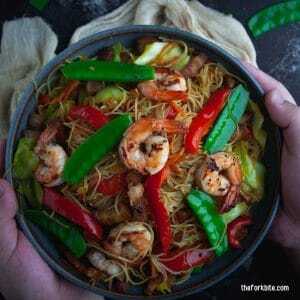 Wash the green papaya and peel off the skin using a knife or a peeler. Add 2 cloves of garlic and 5 chilies to the mortar. Pound them for a few seconds until the garlic is crushed and chilies are reduced to small bits. 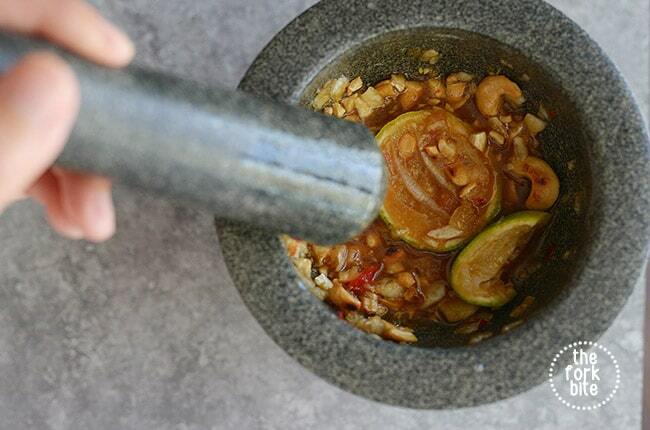 Add ½ tablespoon of palm sugar, 1 tablespoon of fish sauce, and then squeeze the juice from 1 - 2 limes into the mortar. (you can always adjust/balance the flavor according to your liking). Mix and pound the dressing, making sure the palm sugar gets fully dissolved into the liquid. Add one tbsp of roasted peanuts, 1 tbsp dried shrimp, and then roughly slice in the tomatoes into the mortar. Pound the mixture for about 30 seconds, lightly breaking up the tomatoes, shrimp, and peanuts. 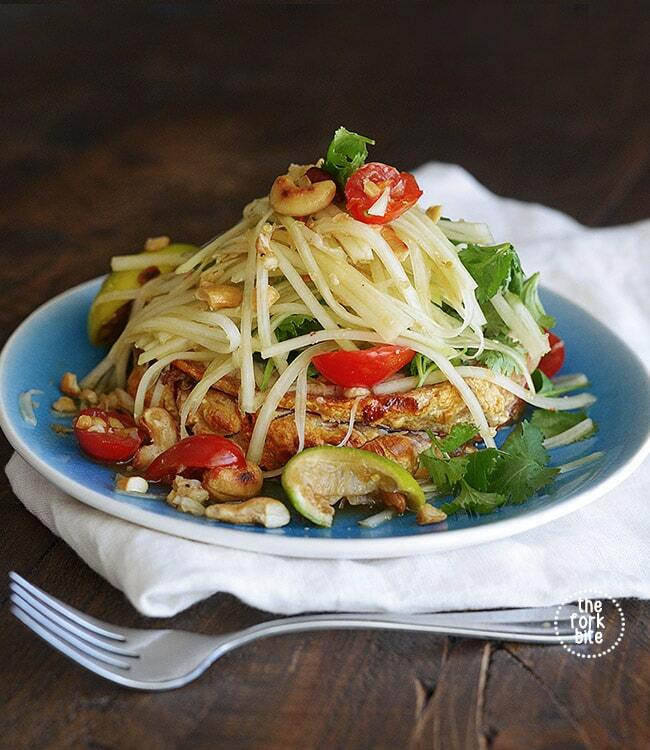 Toss in a handful of the green papaya shavings. Mix it all together, doing a combination of using just a spoon and pounding lightly. Make sure the dressing is coating all the green papaya and that the salad is evenly mixed. Serve with additional garnish like basil, long beans or more peanuts. 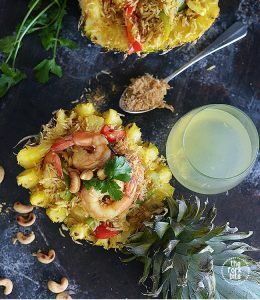 I had green papaya salad while visiting Thailand and I looked at this recipe and thought it kinda similar. 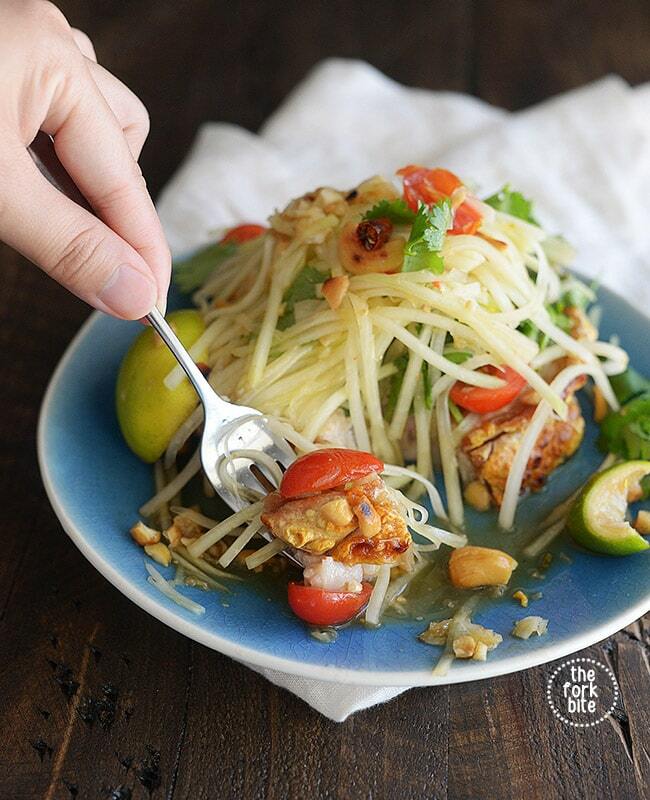 The fish sauce and lime are perfect, fresh Thai chilies work best.. its packed of flavors. I used the shredder in the food processor as I don’t want to use the grater. I like my salad more spicy so I added serrano red pepper and I liked it even more. I used mandolin board to properly julienne the green papaya into thin matchsticks but grater is ok to use as well, just use the large holes and shred as long as possible. I added Jalapeno and cabbage however, I couldn’t find dried shrimps but still turned out awesome! 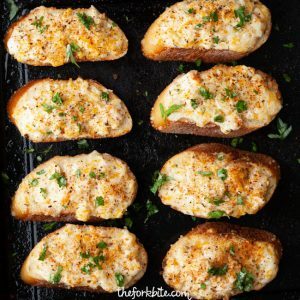 I will recreate this next time but need to grab some ingredients first. Yum! Yum! 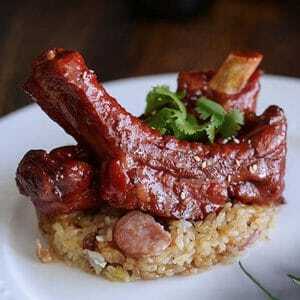 This is one of my favorite Thai dishes.. Packed of flavors.. sure to win over the heart of my vegan hubby.